We settled down to watch Italy play Egypt in South Africa for the Confederations Cup. It seemed sensible to have an Italian wine. It was great fun to watch Egypt win, sadly I didn’t have an Egyptian wine to switch to. 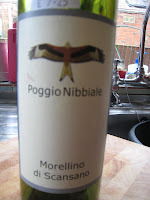 We had a Poggio Nibbiale Morellino di Scansano 2005, which I’d picked up at the Berry Brothers Outlet store. It’s made with organic Sangiovese, I don’t normally seek out organic wines, but I certainly don’t object to them. This wine was dark and leggy, it smelled of rich black cherries and something slightly cigar-like. It has a fairly robust level of tannins, which sit well with the black cherry and damson flavours. This was very unlike the cheery cherry-pop Sangioveses I enjoyed cycling through Tuscany in 2005. It’s more structured and sophisticated, unlike the Italian team tonight.